Dammit, Janet, we love you. Michelle Pfeiffer's O.G. 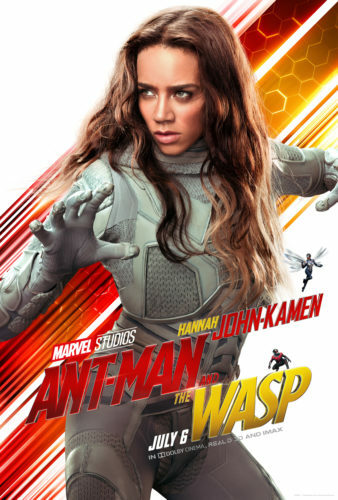 Wasp, Janet Van Dyne, is the coolest reveal in today's new crop of Ant-Man and the Wasp posters, because so far, all we've seen of the character has been Pfeiffer looking relatively normal (for a fabulously glamorous movie star, anyway). Here we see a glimpse of some battle armor, and a look that can and probably will kill...or at least, beat down. We also get a much clearer look at Ghost, an industrial saboteur who's usually more of an Iron Man foe in the comics, and has ties to Justin Hammer0--can this please lead to Sam Rockwell coming back to the Marvel Cinematic Universe? Played by Hannah John-Kamen, this Ghost is female, and apparently able to access the Quantum Realm. Laurence Fishburne's prominence as Bill Foster is interesting. Could it mean Goliath will play a bigger (pun intended) role than we've seen so far? The poster, which has him in casual duds to match Hank Pym's, ain't sayin'. 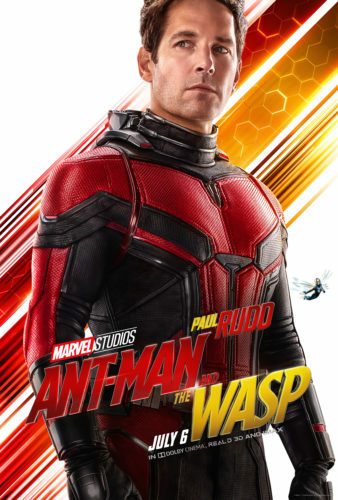 Notice there are tiny li'l Ant-Man and Wasps on each poster except for the two main heroes, who only get mini-versions of the other one. Also note: Michael Pena not getting his own poster. Does this mean less Luis? Do these images get you more hyped for Ant-Man and the Wasp? Crawl or fly down into comments and let us know. The Spider-Man animated movie has a trailer now. Our review of Jurassic World: Fallen Kingdom. The LEGO Movie 2 trailer goes apocalyptic.